Meditation helps us to cultivate both our eternal life and our mortal life, and meditation will ultimately allow us to become born again as human beings of the cosmic autumn. 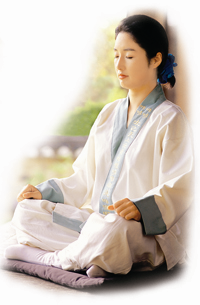 At our dojangs, Jeung San Do practitioners are taught the proper theory and proper fundamental techniques of meditation. Chanting meditation opens us to the spiritual nature of the universe; guides us to limitless expression of the soul; and heals our body, mind and soul. Jeung San Do practices eight mantras, the most important of which is the Taeeulju Mantra. Chanting its sacred healing sounds connects us to the healing power and protective energy of Taeeul Heaven, the origin of human life and enlightenment.